We’ve heard the word ‘legacy’ again as we learn of Washington’s recent agreement with Iran. What do you predict about Obama’s legacy? Do you think he’ll turn out to be another Chamberlain? In a way, the Chamberlain analogy is too easy to make. Iran and Germany are not that comparable, and certainly our position in 2015, and Britain’s position in 1938 are not that comparable either. Perhaps even more significantly, the world war had not yet started in 1938, whereas the world war underway now started twelve years ago, when we invaded Iraq in 2003. Historians will disagree about the way that conflict spread, but no doubt exists about where we are now. So the context and parties for the recent agreement with Iran differ substantially from the structure of relationships that existed in 1938. One rough similarity is that Japan’s war of aggression throughout the Far East was well underway in the late ’30s. It would be more than three years, at Pearl Harbor, before the East Asian war became closely tied to the European conflict that began in earnest at Munich. Again, our relationship with Iran differs a great deal from Britain’s relationship with Germany. Hitler wanted peace with Britain so he could expand to the east. He wanted peace with Russia so he could expand to the west. He wound up fighting on both fronts, and losing. Iran shows no desire to initiate conflict with any nation, yet it shows plenty of ambition to expand its influence. If it can do so without fighting, that shows recognizable shrewdness. Now, why would Israel denounce this agreement, and Obama champion it? You can tell from the way I’ve started here that I think, for all of the problems with Netanyahu’s argument, his position is more likely to stand up a hundred years from now. Unfortunately for my own cold analysis of our relationship current relationship with Iran, I have one axe to grind, and one horse in this race. The axe is that I’ve opposed war with Iran, and I’ve opposed all the talk of war. The sabre-rattling is a subject of its own, but altogether it does not impress people. We can say confidently that it does not impress Iran’s strategists. John Kerry and Iranian foreign minister Javad Zarif. The horse is John Kerry, a hometown Massachusetts guy I admire because he took an unpopular stand against the Vietnam war after he served well there. His leadership of the anti-war movement in the 1970s may have cost him the presidency, as the mainstream press gave the swift boat liars a pass during the 2004 campaign. Don’t rely on anyone caring about the truth, when lies have approval from the White House. 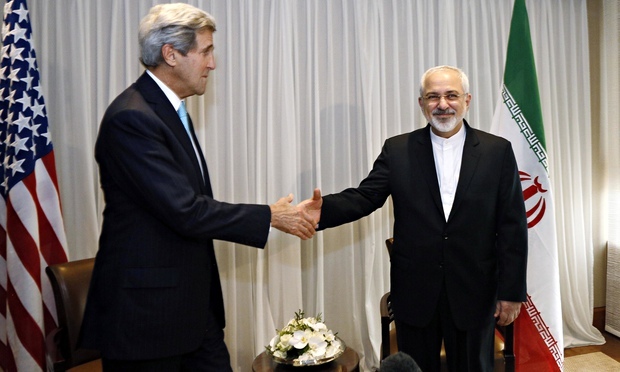 In any case, Kerry had a major part in securing this agreement with Iran. The likelihood is high that his good reputation will suffer a lot for it. The role of Secretary of State under Obama is not a good role to have. The most telling event, immediately after announcement of the agreement, was Bashar al-Assad’s message of congratulations to Iran’s President Rouhani. Heads of state usually send messages to each other in private. They have understandings about what communications ought to be public. Generally both heads of state have a common interest in publicity or privacy, whichever might apply for a particular message. If they don’t have a common interest, the message isn’t sent. So immediate publication of Assad’s congratulatory message to Rouhani is significant. They both have an interest, at the moment, in having the United States on their side. Assad couldn’t exactly send the same message to Obama, though I’m sure he would have liked to. Imagine though how this message looks to Israel and Saudi Arabia. These two powers have known for some time they cannot rely on the U. S., but now they really know, and it’s all public. The U. S. will not deploy troops to defend Damascus, by any means. It does not want to become involved in the Syrian ground war. The U. S. has stated as clearly as it can, though, that it welcomes Iran’s increase in power and stature over the last decade, from Damascus to Baghdad and beyond. It also welcomes Iran’s growth in the region over the next ten years. Friendship with Iran may actually be a good thing for the United States, but that friendship is clearly not part of a larger strategy for peace. Will this agreement force Israel and Saudi Arabia into closer cooperation? That’s hard to say. Will it help Assad win the civil war in Syria? That’s doubtful. Syria and Iraq don’t exist anymore, no matter what the United States says. What takes their place years from now isn’t clear at all. We know Iran would like to have friendly neighbors. Every nation likes to have friendly nations on its borders. Our agreement with Iran declares that we are a friendly if distant neighbor, at least for the moment, and that we’d like to help Iran achieve some security in the region. Is that legacy worth trading away our relationships with Israel and Saudi Arabia? We’ll see. Perhaps the latter two powers will find reasons to stick with the U. S. With an election in 2016, the wait-and-see position for them is to see who moves into the White House in January 2017. Meantime, the series of civil and international conflicts that have Damascus as their geographical center will not become smaller during the next two years. That is the context for this agreement with Iran: warfare that began in 2003 and spreads from year to year. Refugees that used to number in the thousands now number in the millions. We cannot count the number of dead, the number of villages bombed and burned, the number of tribes and families broken. The warfare is incredibly widespread. Perhaps to compensate for the breadth of the horror, our media focus on one conflict at a time, if they focus on anything overseas at all. Obama and Kerry have narrower goals as they pursue an agreement with Iran. They had to decide early that they would not let talks with Iran become linked with wider questions about peace in the region. But they also knew that wider questions about peace in the region would affect how the agreement turns out. In that way, the current warfare, the agreement between the United States and Iran, and President Obama’s legacy in world affairs could not be linked more closely. Thank you for the correction, and thank you for reading!